I’m trying to be tough…and say no to booze and yes to running and hell yeah to the best balance ever! Thanksgiving came and went and it was filled with love, family, friends, amazing food and booze. With there being no grey in my gluttony. I overdosed on good times, long distance family, bourbon, my dad’s stuffing, brother’s turkey and hugs. With absolutely no regrets. I’m liking my body again – though the scale hasn’t really budged much. My confidence is coming back. I’m loving my curves. I feel mentally and physically on point again. The good: I was nervous to go shopping with my family because I was deathly afraid I wouldn’t fit into a single size 14. However, every single dress I tried on was a size 14 and every single dress fit me! I even had my first experience shopping at White House Black Market and things fitting me! I cannot explain how amazing this was for my self esteem. I bought the most banging LBD for Kevin’s B&W company party in Hollywood. A size 14 – and the complaint people have about that dress is that it runs small. That picture does not do it justice. At all. Whatsoever. In fact, when I tried it on some guy was there shopping with his wife (clearly a size 0) and when she was in the fitting room he KEPT making comments about me in the dress. Things like, “That’s the one.” “That looks incredible.” “You don’t need to try anything else on.” etc. Borderline creepy. I was definitely eye banged. Alicia told me had I not bought it he probably would have bought it for me, as apparently he also discussed with her me in the dress while I was in the fitting room. Definitely a boost for the self esteem. The best part? Kevin just said, “Wow” when I tried it on for him at home…and let’s be honest – that’s all any woman wants to hear from the person they love. 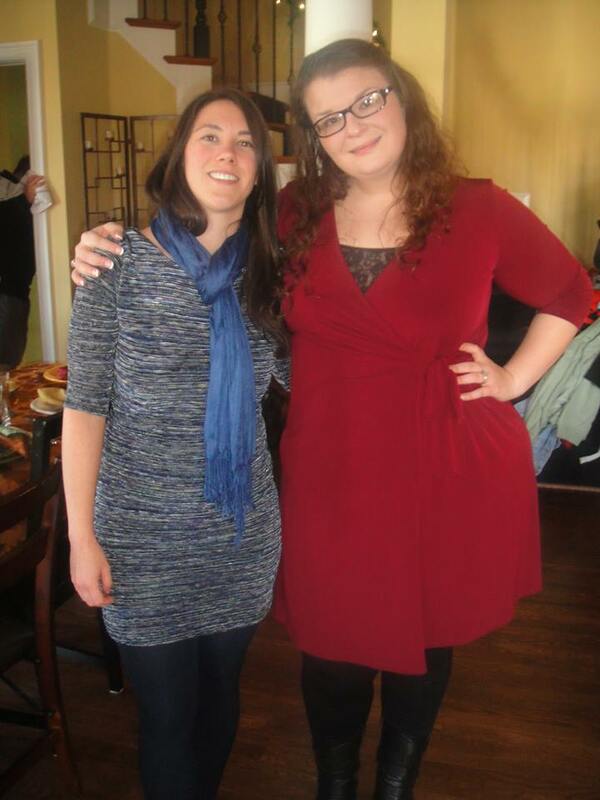 The bad: I was not feeling the Thanksgiving picture I saw of myself. My “hip”pos were out in full force…sweet Jesus. However, now that I think about it – in my defense, I’m standing next to my tiny, petite pygmy (meant lovingly, of course and with no offense to legit pygmies) bff in the world (5′ on a good day and an XS). So, now I do not feel so bad about my proportions. Last bad: I finally caved and went to a Minute Clinic because I still havent felt 100%. Sure enough – I have a gross sinus infection and they put me on antibiotics…but not without some comment about me not waiting so long next time. Awfully judgey, if you ask me. The Ugly: Good God this is ugly. I’ve realized the impact carbs have on me. And by impact, I mean the ravenous, I will eat your arm off and and then people will think I’m on bath salts – holy hell, I’m so hungry that I’m hangry and hate everyone – kind of impact. It’s bad news bears. So, I’m dropping the carbs until I feel like I have a better control over my hunger/eating. I’m honestly not sure how much of them I’ll reincorporate into my daily diet; however, I do know I won’t let myself become obsessed with it. I’ll just continue making choices that aren’t crazy high in carbs. The Recommended Dietary Allowance is 130 grams, but when I eat 130 grams I am too damn hungry all day. So, for the past 3 days I decided to do an experiment and remove the carbs from my diet. So, I counted nothing and ate what sounded good sans carbs. I went back the next day to track it and I was only eating 15-20 or so carbs and around 1300-1400 calories and drum roll please…I was not hungry once. My days have kinda looked like this: 2 hard boiled eggs plus one egg white, celery and pb, chicken salad, stick of cheddar cheese, asparagus/ham wraps and for dinner rotisserie chicken and riced cauliflower with cheese. Last night I made chicken fried “riced” cauliflower. I ❤ Cauliflower. True Story. Does anyone have a good cauliflower pizza crust recipe? I’m contemplating trying it! I am so happy for you! For everything you posted on here, your good, bad, and uglies. Even the uglies are ones that you have twisted into a positive “learning” experience. Ok, so the sinus infection, not so much and I hope that your feeling better soon. Just focus on how great you felt getting into those size 14s!!!! Also, yes, you must post a pic of YOU in that LBD, because that model does not do it justice. It was made for YOU m'lady. There is a gap. We should start a “friend gap” trend, like a thigh gap trend. That’s such a great boost when you can buy a smaller size! Congrats on that, you look great!